Grow relationships with your team, your friends, your people. Have fun making memories together. It Just Flows calligraphy workshops are designed to empower everyday difference makers to create meaningful connections so they can impact their world from a full heart. Are you and those around you feeling the stress of keeping up with the increasing pace of life, work, social engagements, and serving others? Today we live in a rapidly changing world. Our lives are increasingly full. We’re working harder to keep up, yet feeling more behind. We have more material resources than ever before, our social-media connections are increasing, yet our sense of disconnection and mental health challenges are on the rise. It Just Flows creative workshops create space for you and your people to intentionally engage in all these ways. 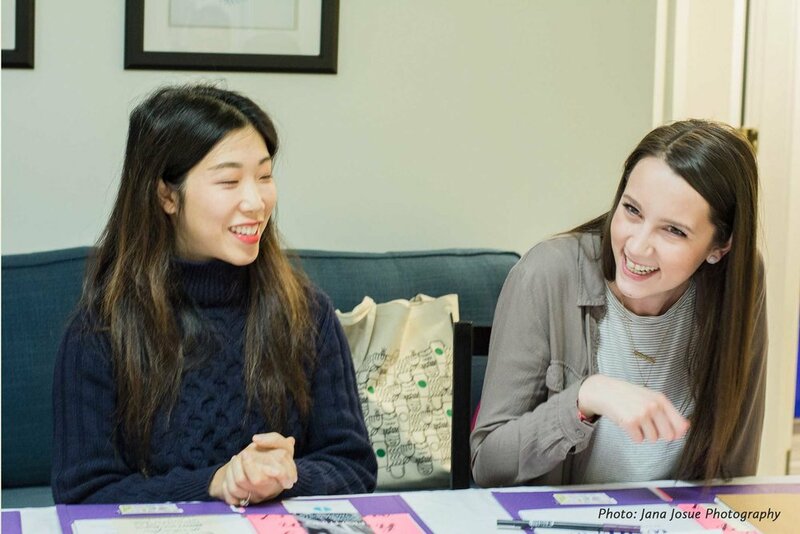 Connect with Justine Hwang to create a private calligraphy workshop in Vancouver, BC for your group of friends for special celebrations, corporate team building events for staff, or retreats (will travel!). We make room and margin to partner with non profit and community groups in creative ways. We’d love to hear from you to start the conversation. Connect with us to start the process with a free no obligation conversation about your group’s needs, goals, ideas. We will work with you to use our core workshop offerings and create a customized workshop design consisting of instruction, hands-on creative exercises, and group discussions to help integrate learning. At this time details will be discussed including themes, goals, participants, timeframe, and location. Justine Hwang will facilitate your creative workshop with your group at the location of your choice. All supplies are included including customized workbooks or handouts, personalized name tags, community toolbox of pens and project materials. Would you like to receive emails about the newest workshops, inspirations, and offers? You may unsubscribe at any time if you're not feeling the connection anymore. Yes, I consent to having this website store my submitted information so they can respond to my inquiry.